Lieutenant Frank de Pass of the 34th Prince Albert Victor’s Own Poona Horse was the first Jewish recipient of the Victoria Cross (VC) and also the first Indian Army officer to win the award in the First World War. The British and French victory at the First Battle of Ypres (19 October – 22 November 1914) marked the end of the war of movement on the Western Front. Both sides dug in and a line of trenches soon ran from the Channel to the Swiss frontier. On 23 November 1914 the 34th Prince Albert Victor’s Own Poona Horse, part of the recently arrived Indian Corps sent to reinforce the British Expeditionary Force (BEF), found themselves in the trenches at Festubert, a small village to the east of Béthune in France. The following morning the Germans attacked both them and the adjacent British and Indian Army units. During the subsequent fighting, Lieutenant Frank de Pass of the Poona Horse became the first Jewish recipient of the Victoria Cross (VC) and also the first Indian Army officer to win the award in the First World War. A reconnaissance by Indian soldiers of de Pass’s unit discovered that the Germans had built a sap (a small trench) near their parapet. The enemy had then erected a sandbagged traverse from which they could throw bombs into the British trench, causing several casualties. 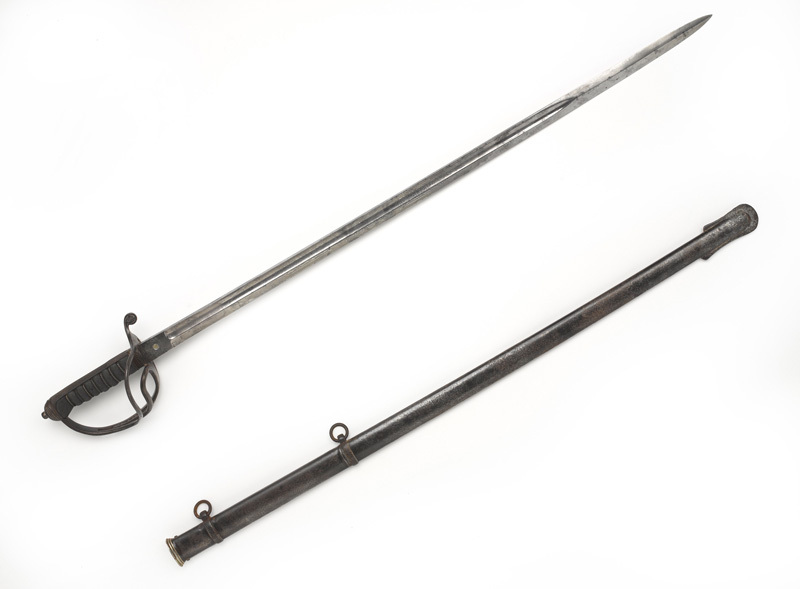 Lieutenant de Pass, along with Sowars Fateh Khan and Firman Shah, volunteered to destroy the traverse with a charge of gun cotton (a type of explosive). The three men achieved this and returned unscathed, despite coming under attack by German bombers. Later the same day, under heavy fire, de Pass and Private C Cook from the 7th (The Princess Royal’s) Dragoon Guards rescued a wounded sepoy of the 58th Vaughan’s Rifles who was lying exposed in the open. 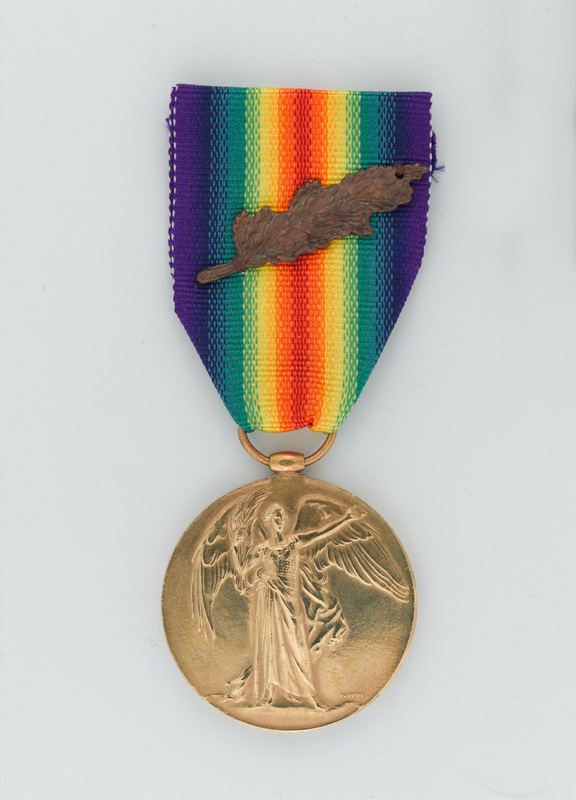 When the Germans attacked again the following day, and once more bombs rained down on the Poona Horse’s trench, Lieutenant de Pass volunteered to repair part of the parapet that had been damaged. As he started to do this he spotted a sniper. He tried to shoot him but was himself shot in the head and killed. Frank Alexander de Pass (1887-1914) was born in 1887, the son of Eliot and Beatrice de Pass of 23 Queen’s Gate Terrace, Kensington. His father was a West India merchant. Frank had two brothers and was educated at the Abbey School in Beckenham and at Rugby School. After attending the Royal Military Academy at Woolwich, he was commissioned into the Royal Horse Artillery in December 1906. He transferred to the 34th Prince Albert Victor’s Own Poona Horse in 1909, having been made a lieutenant in March of that year. A skilled student of Indian languages, Frank was also a fine polo player. In 1913 he was appointed orderly officer to Lieutenant-General Sir Percy Lake, Chief of the General Staff in India. The following year he was engaged to be married. 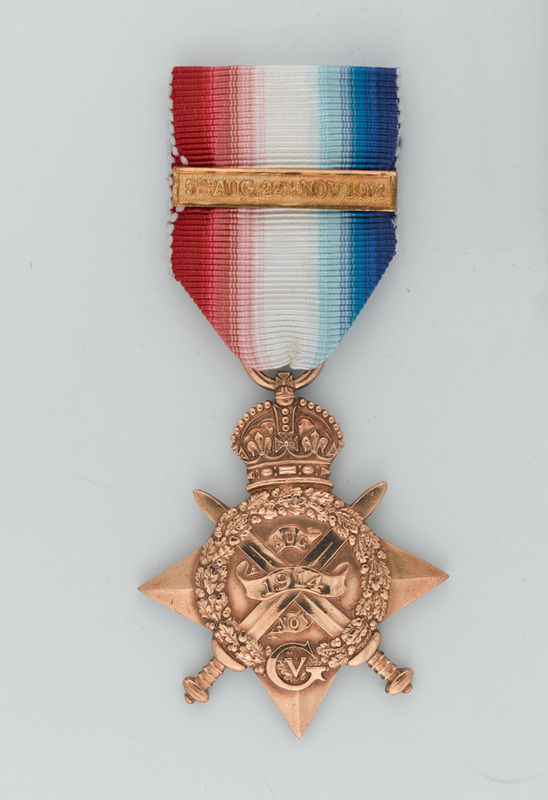 On the outbreak of war in August 1914 Frank’s regiment was stationed at Secunderabad in India. 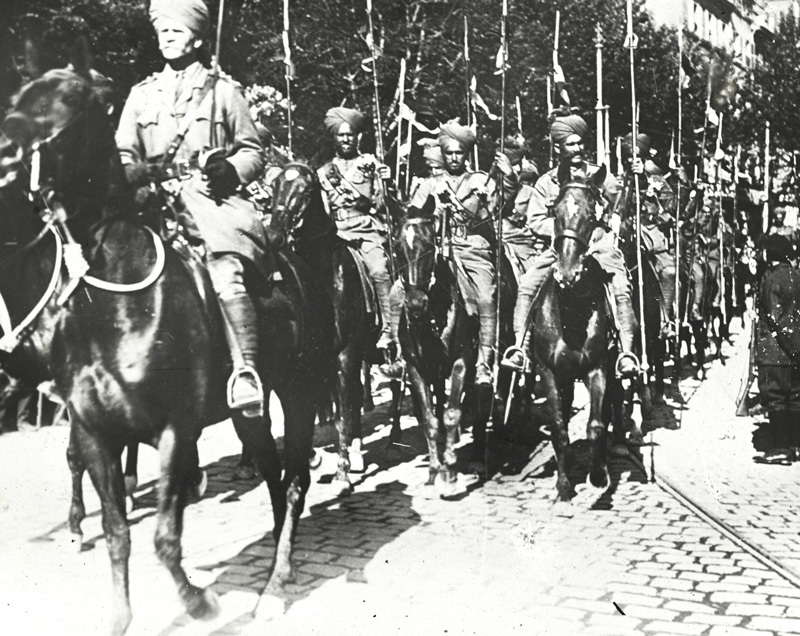 Part of the 9th Cavalry Brigade of 2nd Indian Cavalry Division, the Poona Horse was sent from Bombay to France, landing at Marseilles on 13 October 1914. 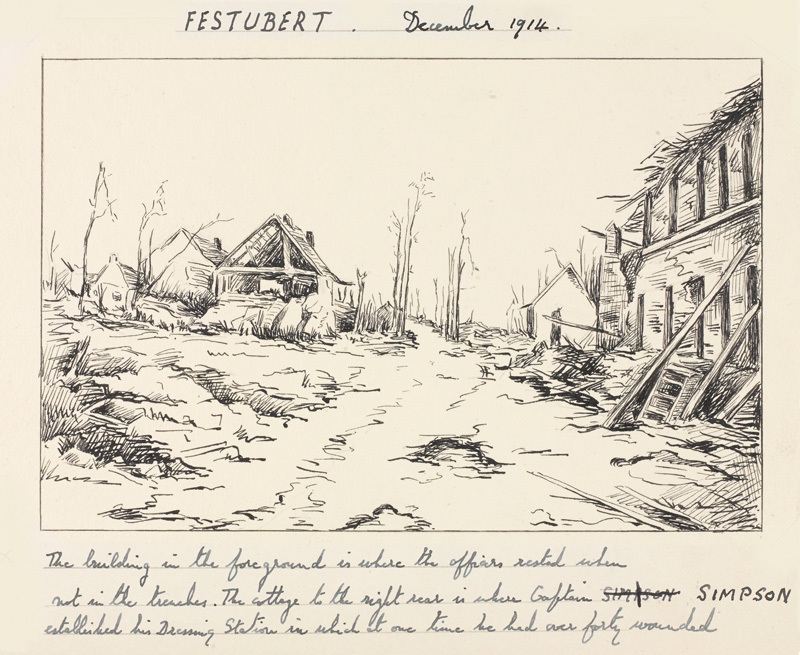 Their first major engagements on the Western Front were the Battles of La Bassée (10 October – 2 November) and Armentières (13 October – 2 November) during the ‘Race to the Sea’, a period of fighting that saw both sides attempt to outflank each other to the north. For most of this period the Poona Horse fought dismounted but sometimes they acted as a mobile reserve. Frank de Pass’s VC was announced in The London Gazette of 18 February 1915. 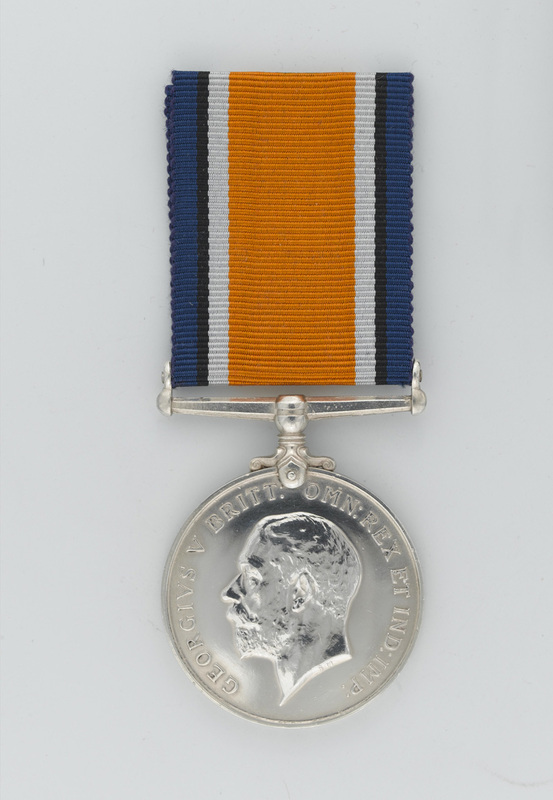 The two Indian soldiers who had helped him received the Indian Distinguished Service Medal, while Private Cook of the 7th Dragoon Guards was awarded the Distinguished Conduct Medal for his role in the action. Unfortunately, Frank’s father was too ill to attend the official investiture at Buckingham Palace so his son’s VC was posted to him. 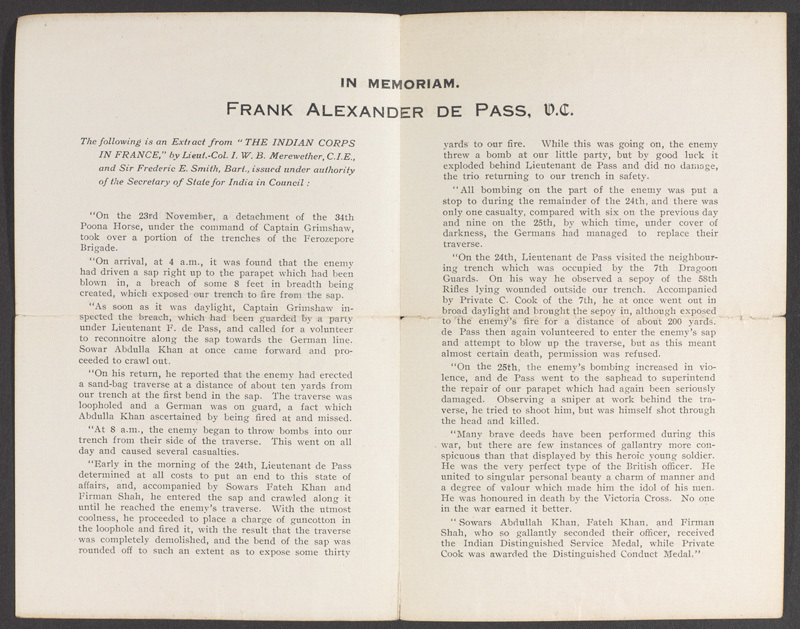 Frank de Pass was buried at Béthune Town Cemetery. He is also commemorated on the Bevis Marks Synagogue war memorial in the City of London and on the war memorial in the chapel at Rugby School. A paving stone is due to be unveiled outside his birthplace as part of the UK government’s First World War Centenary Programme.